Wolff-Parkinson-White (WPW) Syndrome is a cardiac condition where the ventricles depolarize sooner then normal and results in an elevated heart rate. WPW syndrome is caused by an accessory pathway (known as the bundle of Kent) between the atria and ventricles. 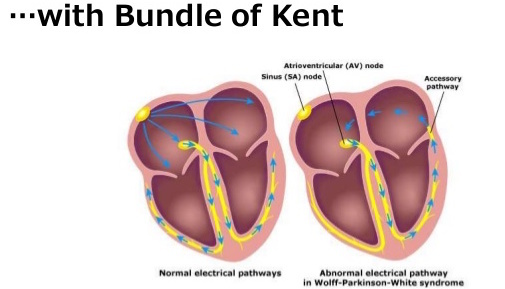 Normally, the AV node is the only passageway for electrical conduction, however those with WPW syndrome these patients also can send an impulse through the bundle of Kent. This extra pathway causes the ventricles to begin depolarizing sooner then normal and leads to a premature upsloping in the QRS complex known as a delta wave, as well as tachycardia. WPW syndrome can lead to supra ventricular tachycardia (SVT).